Research in Motion, which reports its fourth-quarter results after market close, continues to feel the pressure from all sides. WATERLOO, Ontario ( TheStreet) -- Beleaguered handset maker Research In Motion ( RIMM, which reports its fourth-quarter results after market close, continues to feel the pressure from Apple ( AAPL - Get Report), Google ( GOOG - Get Report) Android devices and, increasingly, Microsoft ( MSFT - Get Report) Windows phones. RIM's fiscal fourth-quarter report after Thursday's close will be the first since new CEO Thorsten Heins took over from the embattled management duo of Jim Balsillie and Mike Lazaridis. The incoming RIM chief faces a massive challenge turning RIM around. 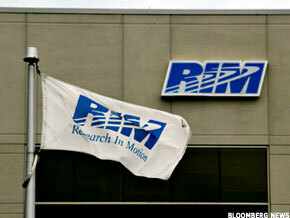 RIM reports fourth-quarter results after market close. "Our monthly channel checks indicated weak sell-through trends for BlackBerry 7 smartphones despite increased marketing efforts," explained Michael Walkley, an analyst at Canaccord Genuity, in a note released on Thursday. "With strong share gains for the iPhone 4S, increasingly price-competitive Android smartphones, improving Windows smartphones, and strong initial sales trends for the new iPad, we anticipate increasing competition across all of RIM's products." Analysts surveyed by Thomson Reuters expect RIM to report revenue of $4.54 billion, and earnings of 81 cents a share, down from $5.6 billion and $1.78 a share in the prior year's quarter. RIM has forecast fourth-quarter revenue of between $4.6 billion and $4.9 billion, and earnings ranging from 80 to 85 cents a share. "Our supply chain feedback is that BlackBerry continues to lose momentum to iOS and Android while Windows Phone appears to be gaining some traction," added Shaw Wu, an analyst at Sterne Agee, in a recent note. Microsoft does not break out Windows phone shipments, although research firm Strategy Analytics recently estimated that global smartphone shipments based on the OS reached 2.7 million during the fourth quarter of 2011, a 36% sequential increase. Nokia ( NOK, notes Strategy Analytics, overtook HTC to become the world's largest Microsoft smartphone vendor, with 33% market share. While the estimated Windows Phones number pales when compared to the 37 million iPhones shipped during Apple's most recent quarter, it has been suggested that the software giant may surpass the BlackBerry user base as early as 2013. Guilty of taking its eye off the ball at a crucial point in the smartphone game, RIM has bled market share. The Canadian firm has also been rocked by delayed product launches and its besieged former management team. As a result, investors have lost faith in RIM during the last 12 months, pushing its shares down more than 76%. Apple shares, in contrast, have risen 74% while Microsoft has climbed more than 24% over the same period. In a note released last week, Citigroup predicted that RIM's fourth-quarter results will likely be in-line with analysts' estimates, but warned that the company's guidance may disappoint. "We expect investors to focus on full year outlook (though we do not believe the company will provide this) and any update to the timeline for the new phones that RIMM is planning to launch in the second half of 2012," explained Citigroup analyst Jim Suva, in a note. RIM, he added, is at risk of missing the 2012 back-to-school season thanks to delaying its next QNX-based BlackBerry products to the second half of this year. Analysts surveyed by Thomson Reuters are currerntly looking for RIM to report second-quarter revenue of $4.255 billion and earnings of 66 cents a share. For the coming fiscal year, analysts are looking for sales of $17.31 billion and earnings of $2.74 a share. Sterne Agee's Wu, however, thinks that RIM's guidance may not be as bad as anticipated. "Due to much lowered expectations with the Street cutting estimates aggressively over the past few weeks, we believe RIM may report a decent quarter and guide less worse than expected," he explained, in a note released on Thursday. "Because of this, we would not be surprised to see a near-term relief rally in RIM shares." Wu, however, has a neutral rating on RIM's shares, citing concerns with the company's fundamentals and its upcoming transition to the BlackBerry 10 operating system. RIM's shares dipped 6 cents, or 0.44%, to $13.61 on Thursday.